The Lara family (from left): Joe Mikel, 24, holding Ceddrick Levi, 4; Matthew, 21; Mykaela, 20, holding Jazmine Elena, 2; Joe and Mona. 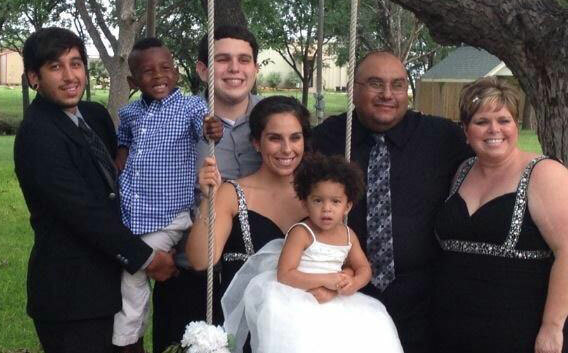 Mona (’05) and Joe Lara of Abilene never intended to adopt a child. Mona shares her story as we continue our series about Abilene Christian University alumni who have followed their hearts to adopt. She is a former pastor of St. Luke United Methodist Church in San Angelo and currently works as continuity of care coordinator for the Betty Hardwick Center in Abilene. Joe is a pipeline engineer for Delek Marketing and Logistics. We had three biological children who were practically grown when we decided to become foster parents. Our oldest son, Joe Mikel, was living on his own and running a business; our middle son, Matthew, was in college; and our daughter, Mykaela – who is currently a student at ACU – was almost finished with high school when we received our first child. Ceddrick came to us at 13 months old. He arrived kicking and screaming with no shoes, no clothes, no car seat and no instructions! In a matter of 10 minutes and two signatures on paperwork, Ceddrick’s and our lives changed forever. With a quick prayer asking for guidance, we took another leap of faith and said yes! It would take more than two years to finalize her adoption, but on Jan. 6, 2014, Jazmine Elena gained a forever family. These two beautiful children have blessed our family more than we can describe. I can’t believe God chose us to receive such a blessing!